Jewelry labels are available in various formats, most common rattail (long-tail) and dumbbell. These labels can be used with a computer or keyboard display unit for standalone printing. 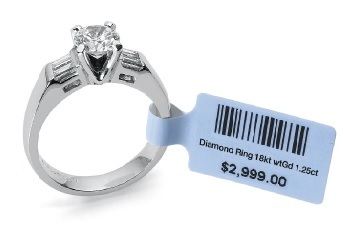 Jewelry labels can be used to display information about your products, including product code, short description, price and a barcode. We are specialized in supplying Rattail Jewelry Tags, Void Jewelry Labels. The Rattail Jewelry Tag is sometimes referred to as a string tag and is quite possibly the most versatile tag design made. We can offer a variety of sizes and materials ranging from industry standard to extra thick to create strong, tear resistant rattail tags.